Smart, sophisticated, laid back. At the same time daring, frail and unpredictable. There is no music like a jazz ballad, where the space in between each chord is just as anticipating as what comes next. Where every syncopation or passage may venture off into a completely different harmonic landscape than you had imagined. Because that’s the art of jazz; to allow your mind and ear pave the way rather than convention. And today, there is no better platform to nurture your creative freedom than EZkeys. 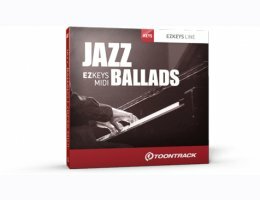 Jazz Ballads EZkeys MIDI comes with a wide selection of playing styles for all the creative facets of jazz ballads through the ages. From the traditional melodic sophistication of the “Jazz Age” in the early 1900s to the cool and saturated harmonics of the post-war times, leading up to the free spirit of avant-garde and all the way to the many faces of more modern-day jazz. This collection of piano MIDI truly is a creative tool and a comprehensive introduction to the awe-inspiring tonalities of the genre. See it as a toe-hold for you to stand on before you throw yourself into the unending well of inspiration to make your very own rendition of what a jazz ballad is, to you.